W&L Hosts Author Blaine Brownell As Part of Yearlong Education and History Initiative Brownell, author of “Washington and Lee University, 1930-2000: Tradition and Transformation” will lecture on the history of W&L. Washington and Lee University will hold a public lecture by author Blaine Brownell ’65 on Nov. 2 at 4 p.m. in Northen Auditorium. The lecture is free and open to the public, and will be streamed live online at https://livestream.com/wlu/blaine-brownell. Following the event Brownell will be available to sign copies of his book. 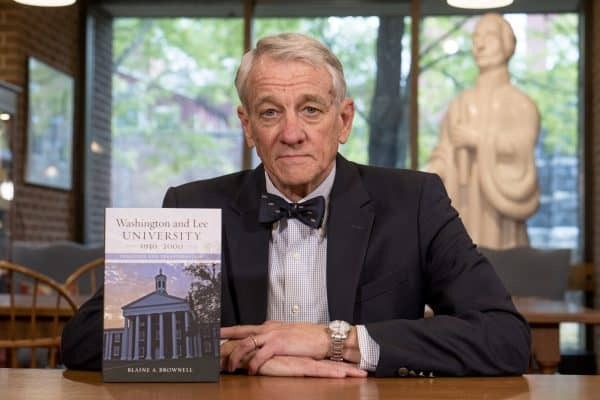 On Nov. 8 there will be a follow-up community discussion of Brownell’s visit, his book, and what this event and its concomitant issues mean in the context of Washington and Lee University. He has an extensive background in higher education, having spent 16 years at the University of Alabama at Birmingham, starting as founding chair and associate professor of history and urban studies and retiring in 1990 as dean of the School of Social and Behavioral Sciences. In addition, he served as provost and vice president for academic affairs and professor of history at the University of North Texas, as director of the University of Memphis Center for International Programs and as president and professor of history and urban planning at Ball State University. Brownell has also held faculty and administrative positions at the University of Memphis, the University of North Texas in Denton, the University of Alabama at Birmingham, and Purdue University. The lecture is sponsored by the Mellon History in the Public Sphere project, the Office of the Provost and the History Department.